From war-games to white papers Russell McGoldrick has already achieved and experienced much in his five years as a defence professional. In June 2012 McGoldrick travelled to Europe to engage with other emerging European and Asia-Pacific leaders in dialogue on the rise of China and its impact on global governance as part of the 2012 Global Emerging Voices Program. Drawing on his professional defence expertise and knowledge of China gained from his studies at The Australian National University, McGoldrick contributed to a dialogue that has helped forge forward-looking ties between Europe, Asia and the Pacific with China as a key reference point. 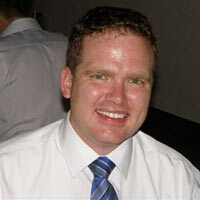 McGoldrick graduated from the ANU College of Asia and the Pacific in 2011 with a Masters of Strategic Affairs. China was a major focus of McGoldrick’s studies at ANU, where he developed a keen interest in Asia Pacific power dynamics. It’s an interest he has maintained and developed in his career. A top performing graduate, McGoldrick completed his tertiary studies while concurrently working for the Australian Department of Defence. He commenced with the Department in 2007 as part of the Defence Graduate Development Program and since then has been based in the Department’s Strategic Policy Division. The Division is charged with providing overarching strategic guidance to inform Defence decision making including the development and use of Defence capability, domestic counter terrorism, arms control and international collaborative programs and regional partnerships. McGoldrick’s career to date has had specific focus on policy development with reference to the Asia Pacific region. Highlights include providing ministerial advice on a range of strategic issues, being a staff officer for Defence’s series of strategic wargames, and now working on the 2013 White Paper. In 2009 McGoldrick represented the Department of Defence at the ASEAN-ISIS Asia-Pacific Round Table where he engaged at length with Chinese academics and policy makers. McGoldrick says he is passionate about international relations with a keen understanding of the importance of historical, cultural, ideational and material factors that inform Asia Pacific relations. "Given the level of diversity in the Asia Pacific, no two parties will ever agree all the time," he says, " however if each party understands why the other holds their views then disagreements can bolster, rather than diminish, the peace and prosperity of our region. This philosophy, together with my personal desire to contribute to peace and cooperation in the Asia Pacific region, informs my deep commitment to a career in international relations." Read Russell McGoldrick’s opinion piece on the place of the United States in the Asia Pacific region written as a result of his participation in the Global Emerging Voices program. Russell McGoldrick participated in the Global Emerging Voices Program thanks to funding from the ANU College of Asia and the Pacific and the Australian Centre for China in the World.